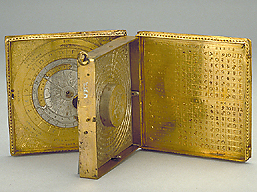 The back of this astronomical compendium is engraved in the manner of a quadrant, marked for common hours and the time of the year, with two cylindrical sights on one side and a plumb bob attached. Inside the main box are a universal equinoctial dial, and a silver compass with engravings and red wax decoration. The instrument is remarkably similar to Epact 82594, and can probably be attributed to the same maker or workshop.